Sung Hsi-lien (Song Xilian) was the son of a Chinese civil servant and became a follower of Sun Yat-sen while attending middle school in the 1920s. He was the youngest student in the first class of the Whampoa Military Academy and participated in the Northern Expedition, where he was wounded. Though jailed briefly for anti-Japanese activities, he received advanced military training in Japan and graduated from the Infantry School and Staff College. Sung helped put down the Fukien Revolt in 1933 and commanded a division at the Battle of Shanghai in 1938. 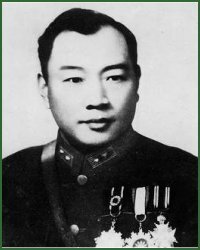 He was briefly dismissed from command for failure to hold the Japanese,but subsequently became the youngest army group commander in China. He commanded 11 Army Group when war broke out in the Pacific. His army group played an important part in the campaign to reopen the Burma Road, but its performance was lackadaisical enough for Sung to be removed from command and given a training assignment. During the Chinese Civil War, Sung was defeated by Liu Po-cheng and driven into Sikang, where Sung was captured. He remained imprisoned until 1959.